Balochistan University Of Engineering & Technology Khuzdar Balochistan. For eligibility criteria of faculty positions at S.No. 1 to 4, please visit. http://hec.gov.pk. • Applications must be submitted on the prescribed application form, available at university website: www.buetk.edu.pk/job.html. • All applications must be supported by an application-processing fee (Non-refundable) of Rs. 1000/- to be deposited at UBL Khuzdar, through Bank challan or in any other bank in Pakistan, in shape of demand draft, in favour of Treasurer-BUET, Khuzdar. • A detailed CV, motivation letter, attested copies of all the testimonials, three recent photographs must be submitted with the application to the office of Deputy Registrar, BUET, Khuzdar by 5th November 2018. • In-service candidates should apply through proper channel. • No TA/DA is admissible. • Incomplete applications, applications without processing fee and application received after due date shall not be accepted. • The University authority reserves the right to increase/decrease in a number of posts, or do not fill any post, without any reason. 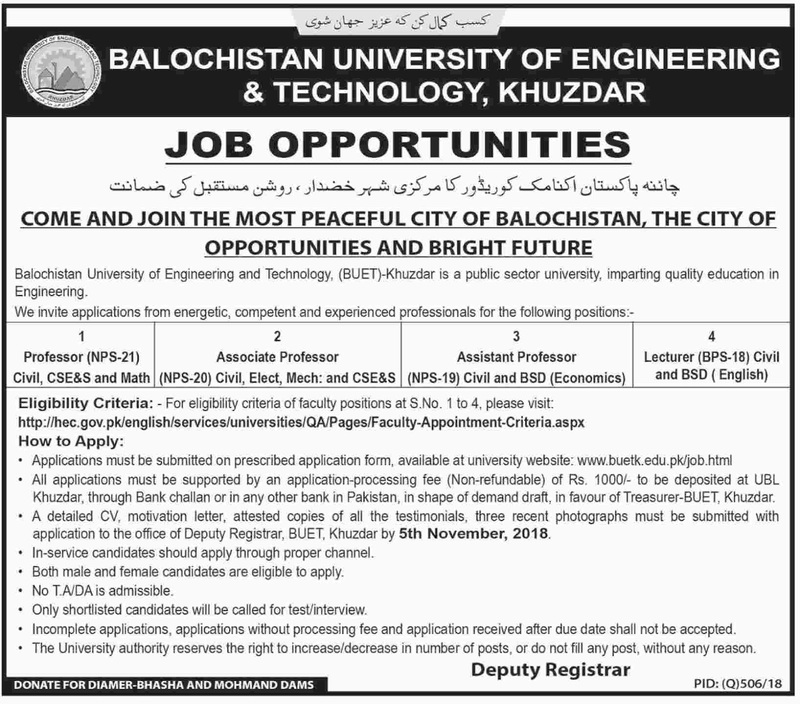 Balochistan University Of Engineering & Technology Khuzdar.